A 16-year-old adolescent girl is brought in by EMS for reported mania. According to her parents, she has been a good student, with no history of drug use. Her initial vital signs are: temperature, 38.9°C (102°F); heart rate, 120 beats/min; respiratory rate, 16 breaths/min; and blood pressure, 140/80 mm Hg. The patient is sweaty, pale, thrashing, and speaking rapidly and incomprehensibly. As you prepare to draw initial laboratory samples, you wonder if this could be a manifestation of hyperthyroidism, and whether drawing samples for thyroid stimulating hormone testing is appropriate. How will you manage this patient if there is evidence of thyrotoxicosis? Will it change your initial medications for treatment of the agitated patient? Are there important findings on other tests you need to watch for? Thyroid disease is a common health problem in the population at large, but it does not often present to the emergency department (ED) as a primary concern. Thyroid disease is less common in children than adults. A Scottish population-based study found the prevalence of hypothyroidism to be 0.135% among all residents aged < 22 years. Of affected patients, 73% had acquired hypothyroidism, 66% of which had an autoimmune basis.1 In areas with screening programs, patients with congenital hypothyroidism are usually identified in the neonatal period; however, this condition may present later in infancy if screening was not performed or in children with diets low in iodine. For an emergency clinician, thyroid disease is often difficult to diagnose, not only because it is uncommon, but because the signs and symptoms are vague and nonspecific and the variety of presentations is wide. This often leads to a delay in diagnosis. Two separate chart reviews2,3 demonstrated that children who were ultimately diagnosed with hyperthyroidism underwent testing for symptoms related to behavior (eg, attention deficit-hyperactivity disorder) or cardiac symptoms, were referred for non–endocrine subspecialist assessments 22.4% of the time, and underwent diagnostic testing and procedures costing as much as $14,000 per patient before their thyroid disease was confirmed. 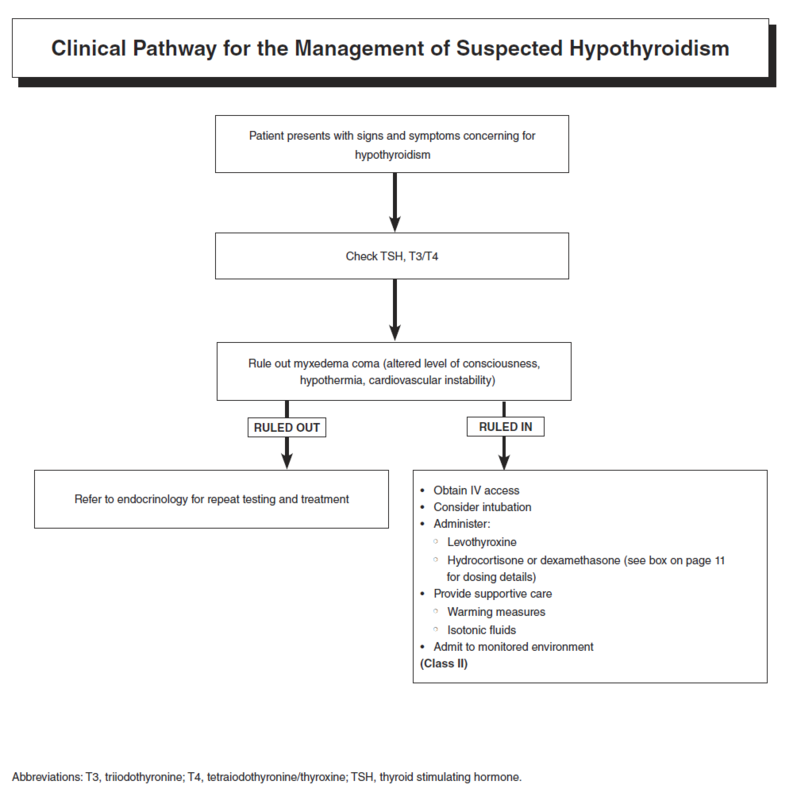 Nonetheless, the ED provides an ideal setting to diagnose and arrange for treatment of thyroid disease. A fresh look at symptoms and signs, the availability of diagnostic testing, and access to pediatric subspecialists for follow-up makes thyroid disease relatively simple to diagnose and treat. Because of the severity of symptoms that can develop, the ED is also the site where acute thyrotoxicosis due to endogenous or exogenous hormone is most likely to present. 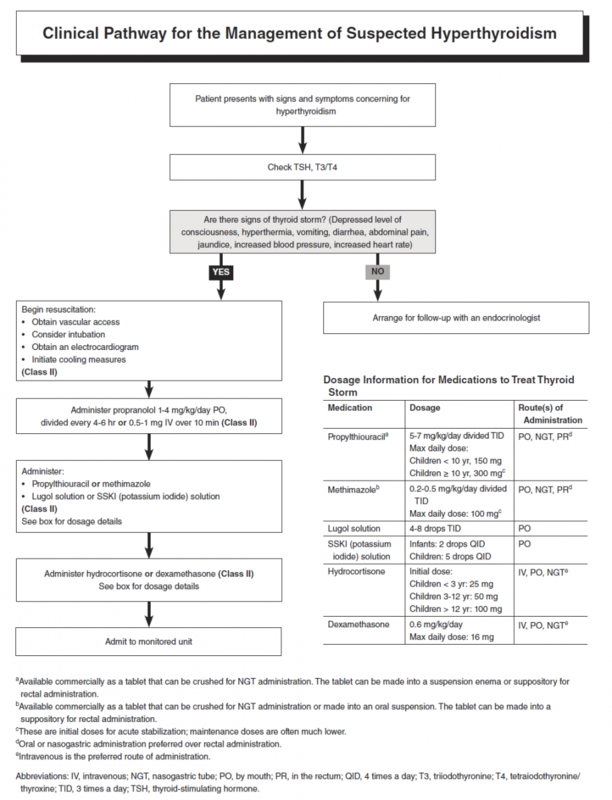 This issue of Pediatric Emergency Medicine Practice reviews common presentations of various thyroid diseases and provides evidence-based recommendations for the management of patients with these diseases. A literature search for articles published from 1990 to the present was performed in PubMed using the terms child, guidelines, thyroid emergencies, hypothyroid, hyperthyroid, thyroid trauma, and thyroid nodule. In addition, the Cochrane Database of Systematic Reviews was searched for reviews related to pediatric thyroid disease. Young children are at risk for thyrotoxicosis from ingestion of levothyroxine, but usually do not show symptoms at the index visit. Ensure that repeat clinical assessments and laboratory evaluations are performed in follow-up. Propranolol and external cooling are the mainstays of ED treatment for thyroid storm. Antipyretics are of uncertain benefit, and salicylates in particular are contraindicated, as they may increase free thyroid hormone levels. Strongly consider evaluating TSH levels in patients with new behavioral complaints, unexplained cardiac complaints, or slipped capital femoral epiphysis. Uncommon presenting complaints associated with hypothyroidism include slipped capital femoral epiphysis, early puberty without pubic hair, pericardial effusion, chronic urticaria, and ovarian torsion. Check thyroid function in patients with these complaints, particularly if the patient has Down syndrome, McCune-Albright syndrome, Turner syndrome, or a personal or family history of thyroid or autoimmune diseases. Hypothyroidism may produce constipation, but this is rarely the only symptom and is usually a late sign. As commencement of thyroxine supplementation in hypothyroidism is not an emergent requirement, discussion with a pediatric endocrinologist and expedited referral is recommended. 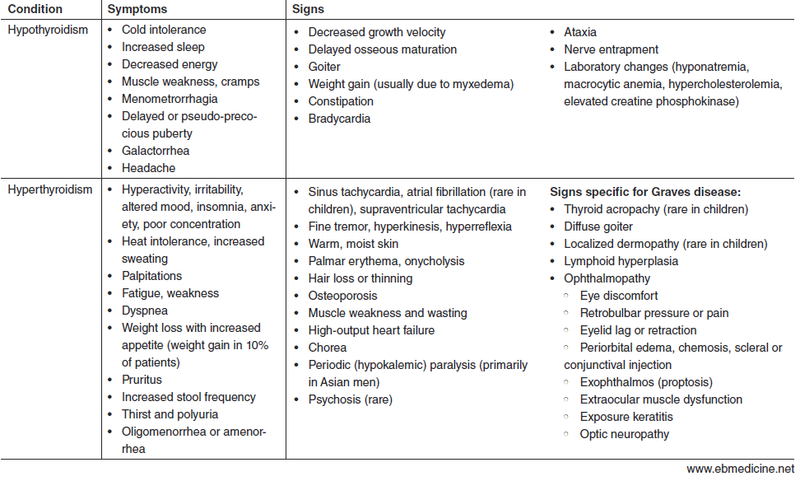 Although incredibly rare in children, suspect myxedema coma in patients presenting with altered level of consciousness, cardiovascular instability, hypothermia, nonpitting edema, or generalized puffiness associated with hypothyroidism. Consider sending electrolytes, urea, creatinine, creatine kinase, lactate dehydrogenase, blood gases, serum cortisol, and blood and urine cultures, and order an ECG. Avoid hypotonic fluids in patients with myxedema coma, due to the risk of worsening hyponatremia. Hypoglycemia, dehydration, prerenal insufficiency, elevation of muscle enzymes, acidosis, and hypoxia may also occur. Thyroid storm should be recognized and treated quickly, as multiorgan dysfunction can occur, with a high fatality rate. Essentials for diagnosis are elevated T3/T4 levels, decreased TSH level, and suspicion of thyroid disease or triggering factors in patients with previously diagnosed hyperthyroidism. Thyroid storm frequently leads to poor tissue oxygenation and ischemia; intubation may be required. In patients with thyroid storm, elevated bilirubin has been found to be associated with high mortality, acting as a marker of hepatic dysfunction. Check markers of organ dysfunction and an ECG for arrhythmias, and plan to admit the patient to the hospital. Give propranolol for patients with thyroid storm to decrease receptor binding and decrease conversion of T4 to T3. Then, give medications to reduce thyroid hormone function and release (eg, propylthiouracil and methimazole). Treatment is expected to reduce metabolic demand and improve vital signs; however, it may take 24 to 48 hours for thyroid hormone levels to return to normal. Patients with unintentional ingestion of levothyroxine are typically asymptomatic but develop symptoms of hyperthyroidism days later. Treat these patients with supportive care and propranolol, if needed, until resolution of symptoms. Order an ultrasound as the first imaging test in patients with thyroid nodules. Pediatric patients with thyroid nodules are more likely than adults to have malignant change within nodules. The thyroid can bleed heavily when injured, resulting in external blood loss or in swelling that can compress the airway. Trauma to the thyroid gland, especially in individuals with pre-existing thyroid disease may lead to massive release of hormones and acute thyrotoxicosis. As thyroid disease can present with nonspecific symptoms, consider testing thyroid function in patients with vague complaints, especially if the complaints are behavioral or cardiac. For patients with thyroid storm, do not administer salicylates, as they may displace thyroid hormone from binding sites and worsen symptoms. Although calcitonin has been used to stratify risk of thyroid malignancy in adults, this is not established in children. Identify presenting complaints, symptoms, and signs concerning for thyroid conditions. Choose appropriate testing strategies to diagnose or exclude thyroid disease. Manage acute symptoms of thyroid diseases and determine disposition and follow-up. Date of Original Release: July 1, 2018. Date of most recent review: June 15, 2018. Termination date: July 1, 2021. Faculty Disclosures: It is the policy of EB Medicine to ensure objectivity, balance, independence, transparency, and scientific rigor in all CME-sponsored educational activities. All faculty participating in the planning or implementation of a sponsored activity are expected to disclose to the audience any relevant financial relationships and to assist in resolving any conflict of interest that may arise from the relationship. Presenters must also make a meaningful disclosure to the audience of their discussions of unlabeled or unapproved drugs or devices. In compliance with all ACCME Essentials, Standards, and Guidelines, all faculty for this CME activity were asked to complete a full disclosure statement. The information received is as follows: Dr. Turner, Dr. Caglar, Dr. Cantor, Dr. Claudius, Dr. Horeczko, Dr. Mishler, and their related parties report no significant financial interest or other relationship with the manufacturer(s) of any commercial product(s) discussed in this educational presentation. Dr. Jagoda made the following disclosures: Consultant, Daiichi Sankyo Inc; Consultant, Pfizer Inc; Consultant, Banyan Biomarkers Inc; Consulting fees, EB Medicine.